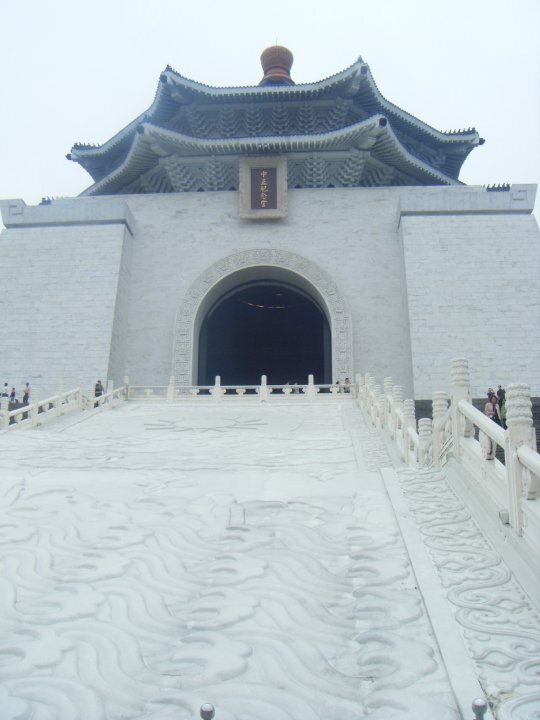 Taiwan was far and away one of my most favorite destinations I traveled to during my study abroad in Hong Kong. Where else could you eat street food this good and even find vegetarian food that made you not miss meat? 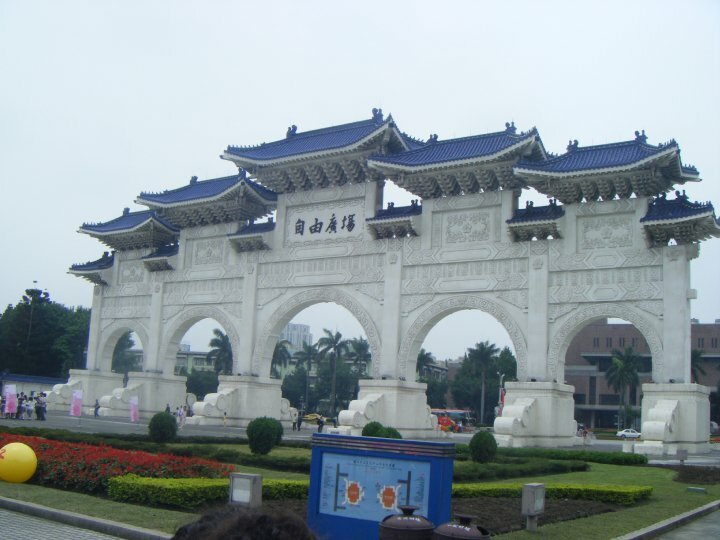 Taipei – that’s where! Plus, they have one of the tallest buildings in the world too – that’s pretty awesome. On our first full day in Taiwan, we decided to go to the Chiang KaiShek Memorial Hall (it was within walking distance), so we headed out to see the memorial. It was really impressive – the hall was this massive blue and white behemoth with a huge statue of Chiang KaiShek himself inside, but what was really interesting that day was what was going on down on the main square. Someone had organized a cheerleading competition, and when we arrived, they were having the competition for the “special” (mentally challenged) cheerleading squads! It was so cute! And they were doing quite well, with a coach in front reminding them what moves to make – I was so impressed that Taipei had organized a competition for every cheerleader who wanted to compete. How very progressive and inclusive. Good for Taiwan! Awesome gate to the Chiang Kai Shek temple grounds. Very impressive Chiang Kai Shek temple. Once we were done there, we went to a vegetarian buffet recommended by Lonely Planet called, “Vegetarian Paradise” because Lucas was a vegetarian, and it had some excellent food. It was filling, it was tasty, Lucas accidentally ate stinky tofu (which was hysterical to watch his reaction to) – it was a good choice. I still knew no meat was involved, but I was okay with it. So many choices. So few animals harmed in the making of this buffet. Then, we headed for the “Miniature Museum of Taiwan,” which is essentially a museum of dollhouses – really, really well made, detailed, super cool dollhouses. It took us almost an hour of wandering around to find the museum thanks to poorly labeled or non-existent street signs and maps, but eventually we made it. It was SO worth the effort. 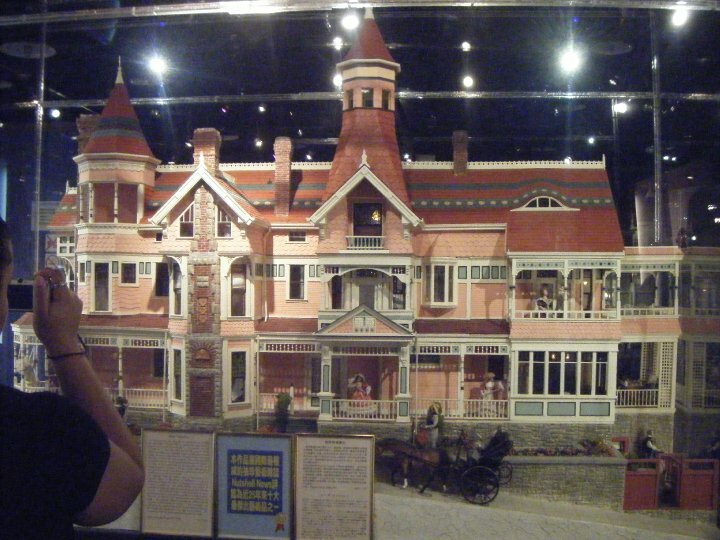 The doll houses were so cool! There were themed ones, like Jack and the Beanstalk, and the Wizard of Oz, as well as the more traditional ones, and ones that looked like castles, old mining towns, German chocolate shops, and movie scenes. Great! Such painstakingly crafted miniatures. So beautiful and ornate. From there, we went to Taipei 101 the one hundred and one story tower in Taipei, which was, for a short time, the tallest building in the world. Our intention was to go up to the top and see the city, but it was too cloudy, so we ended up going down to the food court downstairs, getting some really good pastries from a bakery, and engaging in conversation with two older couples from Singapore who randomly started chatting with us. I have to say, they all spoke excellent English (probably some of the best I’d heard since arriving in Asia), and they were so friendly. Cue the theme to Star Wars as we entered the Death Star mall. We met so many people in Taiwan who spoke at least some English, and it was by far, the friendliest country I went to during my stint in Asia. You’ll see more of what I mean when I tell you more of our exploits in Taiwan. Anyway, we talked with them, and then headed on to our next sight – the Death Star-themed mall! It was described like this in the guidebook, and the description was dead on. As soon as we reached the mall it became apparent this was no ordinary Asian mall. 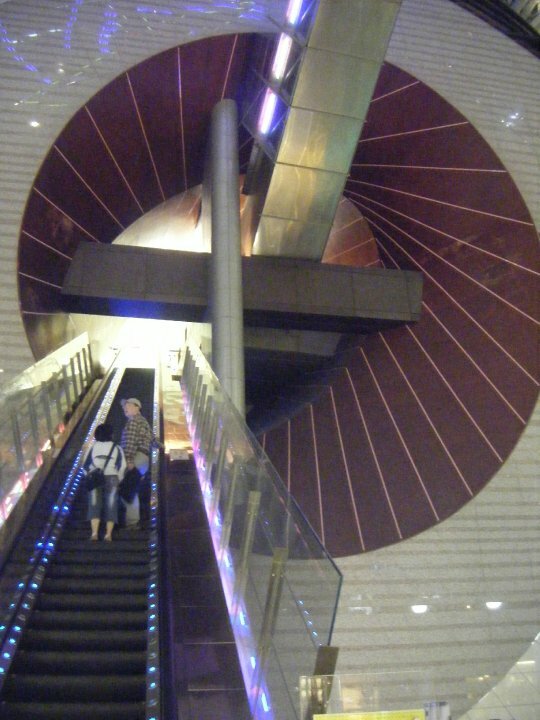 The inside and outside were curved and shaped like a giant golf ball, and as we rode an escalator inside, you felt as if you were riding straight into the heart of the Death Star! No kidding. It was awesome, and no one had ever seen anything remotely like it. When we finished exploring, Janet and Merelyn were more tired than Lucas, Cameron and me, so they stayed to watch a movie, while we went to explore more night markets. We ended up hitting three very awesome night markets successfully that evening, sampling more delicious and sometimes unidentifiable food, and taking some great pictures of the thousands of scooters cruising all over Taipei at night. Definitely another great day all around. 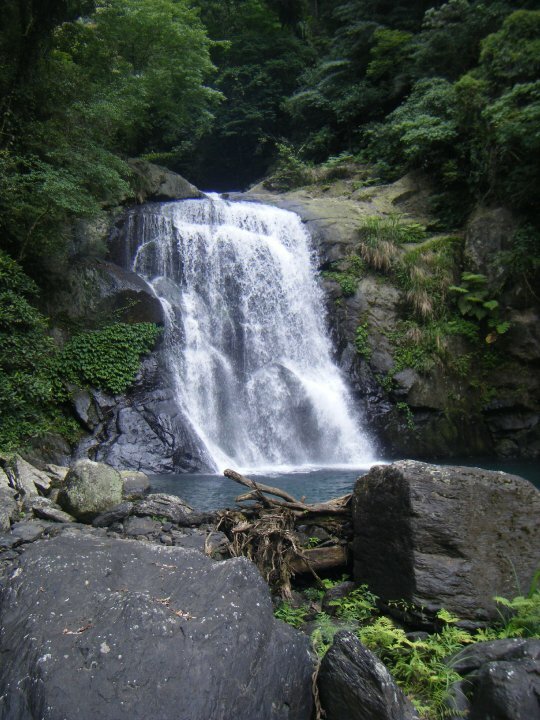 Sunday we ventured outside the city intending to see hot springs and waterfalls inWulai. 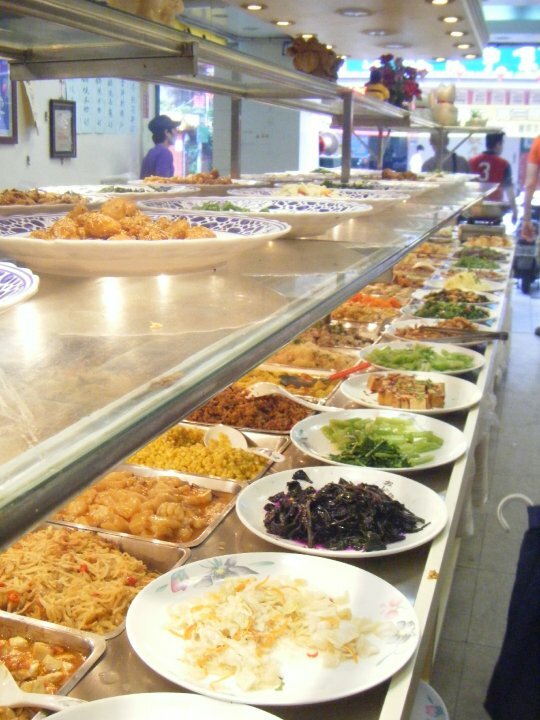 When we arrived, we found ourselves in the midst of Chinese tourists on the main street ofWulai, which was packed with vendors selling – you guessed it: street food! After having breakfast and mid-morning lunch number two we hiked up the hills towards the first waterfall, which was gorgeous! It was so picturesque falling down this rocky sheer cliff, and after wandering there, eating at another vegetarian restaurant (this time unintentionally, although Cameron accused Lucas of masterminding the whole thing), and enjoying the view, we hopped in a cab to theNeidong Nature Preserve about a fifteen minute drive from where we currently were. The exact waterfall background Lucas had on his computer. Who’d have thought it was from here? 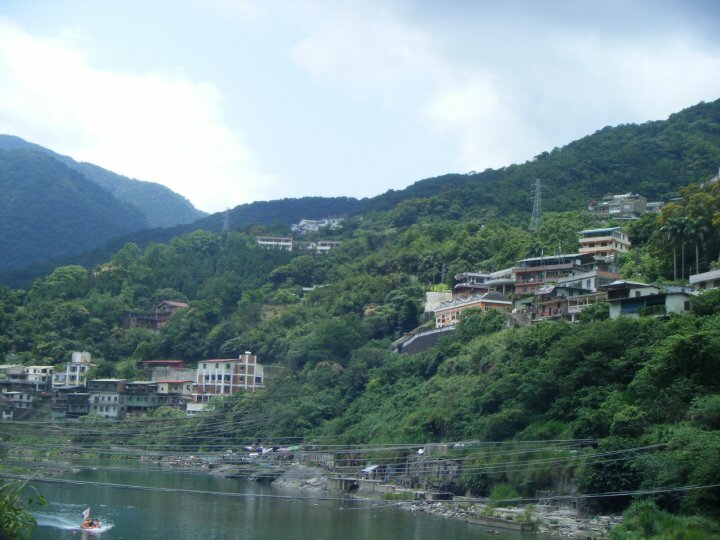 Welcome to Wulai – pretty enough for a postcard, no? The nature preserve was even more fantastic; it had not one, but three waterfalls (one of which was actually the desktop background on Lucas’ computer! ), as well as great hiking trails around the forest. We spent another hour there before taking a cab back to Wulai determined to find a free hot spring to soak our feet in. Back in the middle of town we began hiking out following the river running by and hoping to run into a natural hot spring. After 45 minutes of walking and no free hot springs in sight, we admitted defeat, walked down to the river, waded around in the cold water (which was quite refreshing after all the sweating we had been doing) and finally boarded a bus back to Taipei. Once we arrived in Taipei, went back to the hostel and got cleaned up, we decided to attack Taipei 101 again. Fail number 2 – we got there, were all set to buy our tickets, but then another tourist (also from Hong Kong) told us the view was cloudy and not worth going up to see – he had just been up there. Damn. Foiled again. So we did the only thing left to do; night markets! Were you expecting anything else? That night, we went toXimending thetrendiest night market of them all. 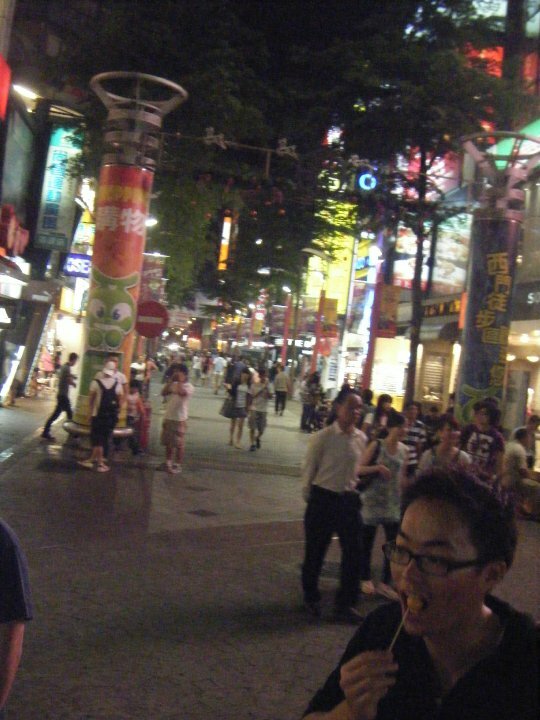 Ximending Night Market. Also great! It was great fun – fantastic food and lots of variety (I even successfully ordered myself a milk tea with bubbles – in MANDARIN! ), fun stores, tattoo parlors, street vendors selling everything from scarves and headbands to watches and shoes. Excellent day yet again, in Taiwan. Don’t miss my final blog about Taiwan – it was the wildest by far. Let’s just say it involved hitchhiking and very expensive cars and leave it that. The cheerleading competition taking place on the plaza in front of the Chiang Kai Shek memorial. This entry was posted in Asia, Taiwan and tagged Asia, Chiang Kai Shek, Death Star, Night Market, Street Food, Taipei, Taiwan, Travels on May 5, 2014 by Paige N..